Food is at the center of our culture, it is a necessity, and is associated with almost every part of our lives. We all have many memories surrounding food, and many habits surrounding food, all in which can be positive or negative depending on our perception and our beliefs. Many of our lifestyle habits stem from childhood, what we were taught at a young age plays a significant role in what we do today; because it is comfortable, homey, and natural. Anything we do that is different is challenging, difficult and takes motivation, drive, and persistence; that is if we really want to experience change. At the root of it all, we want to be at ease, not to be identified with a “dis”ease, right? We want to feel comfortable in our own skin. We want to have a body that is willing and able to do the things we need and love to do no matter our limitations. But different things work for different people because everyone has different goals, priorities, approaches and existing life habits. The best way to find out what is best for you, is to experiment through experience. 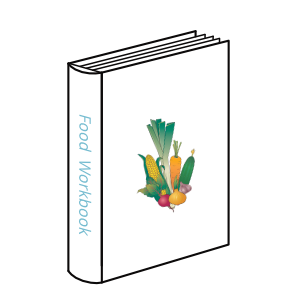 In this workbook you are encouraged to study yourself, and associate your body signals/feelings, aka symptoms, with your thoughts and actions. What do you do habitually when a feeling strikes? How can you replace your feeling->thought->action habit pattern to better serve you? There is only so much you can get from a book or a website. you have to do the dirty work yourself. First you’ll take a look at what you do currently, then you’ll build guidelines to help you replace the habits/routines that are not serving your goals. When learning about food and its effect on the body, it can be easy to dive in too deep to the science and miss the main basic points. Learning is a lifetime process, stick to basics and work your way up. Furthermore, information can easily be contradicted by another person’s experience and their interpretation of that experience, therefor facts are almost irrelevant, and your particular experience is the only thing that matters when building your lifestyle, especially when it comes to food. An open mind that is ready to accept new information is important to growth. If you stay stuck in previous ways of thinking, there is no way to move forward. That doesn’t mean you should accept every piece of information that you come across. When filtering out information it is a combination of your gut feeling or intuition that starts the judgement of whether or not something will work in favor of your goals. Analyze and question the information you find. Does this advice feel right for me? Can it be adjusted to fit me? Have I experienced something different than what is suggested? Do I have something to add? Is there alternative advice, I haven’t found yet? Is there a better way to explain this information? Find people, groups and/or communities you trust and can relate to. Read/listen/watch documentaries, books, articles, journals, etc. Save or share information to a place where you can easily find and refer to. Go to the Learn section and review content and people that peak your interest.